Formerly Living Rooms Landscape Design.... We've changed our brand! It all started with a little blonde girl. Knee deep in muck, catching frogs and climbing trees, spending her summers on an island under the stars. Learning to light a fire, bait a hook, run barefoot in the woods (still do), and master the art of catching poison ivy year after year were all common rituals. I had no idea what I was going to be when I was big, along with every other little dirty kid I knew. But I knew it had to do something with being creative, and being at home with architecture and the mud between my toes. I LOVE plants. They are all unique beasts. Pairing and combining each marvelous one with another gives me the warm and fuzzies. I continue to update my skills, taking courses in Interior Design, Floral Design and Colour Theory which all play a key role in complimenting my skills as a Landscape Designer. When I’m not filling my brain with Latin plant terms or doodling design layouts on Starbucks napkins, you can find me kicking back, dockside, with my mini-me, a H&H magazine in hand, listening to Bobcaygeon.” My bespoke design service will guide you to achieve the outdoor living space of your dreams. Whether you need full support, or prefer to get your hands dirty, I can provide you with all the plans necessary to achieve the beautiful & functional design you deserve. A graduate of Humber College's Landscape Technician Diploma, I started my career working as a designer for one of the most prestigious nurseries in the business. I value the knowledge I gained by being exposed to some of the best varieties of plants in the industry. Wanting to expand my expertise, I worked for two private landscape construction companies that allowed me to refine my design skills while familiarizing myself with up-to-date construction techniques and processes. After branching out on my own, I wanted to create a service that has the client's best interest in mind, not the business. I continue to update my skills, taking courses in Floral Design, Interior Design, and Colour Theory which all play a key role in complimenting my Landscape Design background within the industry. Alica Dusil is a graduate from the Horticulture program in Niagara College. She has been perfecting her craft since 1998, researching and following exterior design trends from all over the world. Dusil Design was started soon after graduating and is now a landscape design company with a creative side serving Burlington, Oakville, Hamilton, Toronto and surrounding areas. We specialize in providing landscapes that fulfill the needs and lifestyles of our clients. With an artistic passion, we come up with new and innovative ways to bring life to areas using plants, and corten steel sculpture and privacy screens. Dusil Design provides award winning designs in both pool design and garden design. We also make the pool design process easy for our clients by drafting up a full backyard design, provide City approved permit drawings as well as save the client time and hassle by filling in the applications and delivering a full package to each Municipality. We compose with space/creating beautiful outdoor spaces is what we have been doing for almost 60 years. Working with inert and living elements we create spaces that come alive with beauty and a sense of presence. From green roofs to gardens on the ground, from commercial to intimate residential, in every garden style from naturalistic to traditional and contemporary, it’s what we are trained to do. We are strongly committed to designing with nature, using materials and techniques that compliment natural systems instead of opposing them. In our view reducing our footprint applies intelligent design with informed construction principles to get it right the first time. For you as well as for the birds and the bees! Whether it’s a beautifully executed green roof or an intimate private garden that seems to draw you in, we compose to inspire! Brian and Joanne Gallant started Cedargate Landscaping in 1991. They are personally involved in every aspect of your landscape project, from consultation to completion and they keep you constantly up-to-date on the progress of the work. Our courteous and professional yard landscaping artists will carry out your design. They take pride in their work and want to make your yard a showcase for what they do. We will work around your schedule and keep the job site clean and safe for you and your family. Planit Green is an Award winning, full service, design and build landscape company operating out of Ancaster, Ontario. Planit Green takes a design driven approach, construction is done 'in house' and covers all aspects of outdoor living, specializing in poolscapes. The world’s a crazy place. You may be experiencing one of the busiest and most demanding phases of your life. So when you need an easy place to kick back, unwind, and enjoy time with family and friends, we’re in your corner. We’ve got creative ideas on how you can transform your yard into a place that really suits your style. Entertain, dine, socialize, or splash along. Whatever you do. Make your space yours. Be different. Live a little. Be yourself. It’s what your family and friends love about you. Founded in 2005, Earthscape is a residential landscape design-build firm with a strong reputation for exceptional customer service and trend-setting principles in design and construction. With offices and crews in Elmira and Toronto, projects are completed for clients across Southern Ontario, including the Greater Toronto Area. Since inception, the company has been awarded more than 50 Landscape Ontario Awards of Excellence for residential landscape design, landscape construction, lighting design, water feature design and maintenance. Excellence in design and workmanship is at the core of Earthscape’s philosophy as a design-build firm. We listen carefully to our client’s vision, ideas and objectives so that we can offer inspiring, thoughtful and innovative solutions to specific landscape needs. With a broad knowledge base in landscape design, materials and construction we offer our unbiased opinion to help clients make the best decisions for their outdoor spaces based on function, aesthetics, style, cost, and durability. With a thorough understanding of your outdoor lifestyle and vision, we collaborate with you to create a landscape that can be enjoyed for decades to come. Our team of professionals includes: landscape architects; designers; project managers; stone masons, licensed carpenters and horticultural experts; and professional trades people. Specializing in custom, one of a kind residential landscape designs and garden plans. Landscape Plus Ltd. is a highly customized residential design build service. We have been creating elegant outdoor spaces in the Greater Toronto Area since 1984. As owner and lead designer I am personally involved in every project from the initial concept and drawings...to sourcing the ideal stone or ironwork... to planting the last perennial. Your house is as unique as you are. Surround it with imagination, texture and colour, throughout the seasons. If you would like to see more of our work, call or email to book an appointment. Let Landscape Plus Ltd. create an elegant outdoor space that welcomes you home. The work of this outdoor professional includes most everything surrounding a home's exterior. A landscaping architect can even work with the home architect to choose the right spot for your Oakville, ON house. From there the Oakville landscaper will develop preliminary concepts for your front or backyard design based on individual needs including the climate and activities that will take place, as well as layouts and planting plans. Landscape architects will also design any structures or outbuildings that will be added to the space. Any grading changes that will be added to the yard are also the responsibility of the architect. This includes any drainage modifications. An engineer can also be responsible for these tasks, but licensed Ontario landscapers are fully capable. Like building architects, they will produce preliminary concept drawings as well as detailed construction documents and planting plans. Three-dimensional renderings and illustrative plans are all supplementary. A Oakville landscaping designer generally will have ecological, aesthetic and technical training, which helps them maximize the potential of your outdoor space. Keeping in mind both style and functionality, garden designers analyze your architecture and yard to produce a plan that may or may not include location and materials for walkways, patios, water features, fences, garden aspects and more. In addition, a landscaper in Oakville, ON will carefully assess your geographic region to choose plants, trees and flowers that will flourish naturally, as well as address concerns such as drainage, screening and soil conditions. Certain landscape designers only help with the planning portion, while some may deliver the plans and then oversee a hired landscaping contractor. Others — typically following a design-build approach — take care of both the design and all aspects of the landscape architecture and construction. Before you hire an Ontario professional landscaper, consider the scope and emphasis of your outdoor project. Landscape architects, who typically hold advanced degrees in their field, are trained to develop comprehensive structural plans that include plants, hardscaping, water use, drainage and more. Landscape designers typically specialize in the aesthetic and horticultural, rather than structural, side of yard and garden planning. They might or might not have advanced training. Even within their fields, a garden designer may specialize in hardscape- or vegetation-focused designs. In some cases you might need to hire additional help to get the outdoor space you want. Here are some related professionals and vendors to complement the work of landscape architects & landscape designers: Landscape Contractors, Garden & Landscape Supplies, Tree Services, Gardeners, Lawn Care & Sprinklers, Decks, Patios & Outdoor Enclosures. Find an Oakville landscape architect on Houzz. 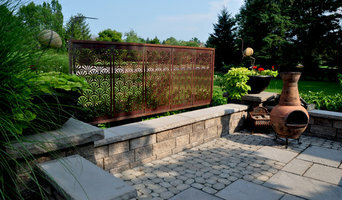 Narrow your search in the Professionals section of the website to Oakville, ON landscape architects and designers. You can also look through Oakville, ON photos to find a space you like, then contact the professional who posted the photo.